AJA International, Inc. has developed and manufactured a wide variety of cooled substrate holders for situations where substrates need to be actively cooled or be kept at limited temperatures. These range from LN2 reservoir to LN2 drip to water cooled versions depending on the application. Custom, backside He gas cooled models are available for ion milling or sputter down configurations. Special cryogenic coldfinger models have also been built although these do not permit substrate rotation. Sizes from 1" to 300mm Ø are available. RF (or DC) biasing is possible for some designs. Shown below left is a motorized, rotating, cooled holder with a 1.5 liter LN2 reservoir for 150 mm substrates. In this version, gravity heat sinks the heavy copper transfer plate to the cooled copper cradle. The castellated transfer plate ensures that the substrate clips do not interfere with the cooled contact area. Positive clamped versions are also available. The "swing in" LN2 ring shown installed at the right is used to accept a high temperature substrate transfer plate and rapidly cool it in vacuum utilizing an LN2 drip system. Custom engineered solutions are always considered if a proven design has not been previously developed. Continuously water cooled, rotating substrate holders as pictured below for 100 mm Ø substrate carriers also feature motorized 3" Z motion. 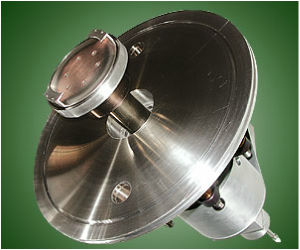 As with the LN2 units, positive clamping is offered with some designs depending on other constraints. 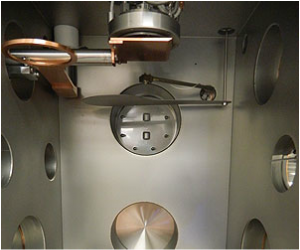 AJA BSG-200 Series Substrate Holders with serpentine gas channels for backside He cooling of Si wafers up to 200 mm Ø. 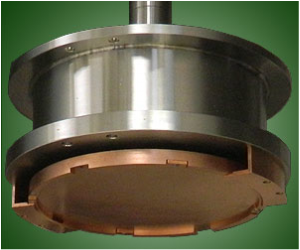 The center image shows the pedestal with mounted silicon wafer in transfer ring. The image on the right shows the complete assembly with weight ring in place. This pilot production design features continuous, motorized rotation, Z height adjustment and auto-transfer capability. UNO Series water cooled holders allow +/- 200° tilting of the substrate in the plane of the substrate surface. With stepper motor control (shown), angular precision is within 0.1°. 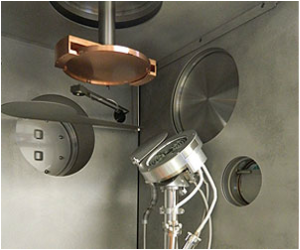 Azimuthal rotation allows for uniform, efficient angled deposition or etching. This component is also compatible with load-lock transfer. This UNO Series holder allows +/- 200° motorized, precision tilting of the substrate in the plane of the substrate surface and temperature control from 5°C to 200°C. This unit is also available in a cooled version operating in the -30°C to +30°C range. The model above is compatible with reactive gases such as Chlorine. This unique design features load-lock compatibility from the end of the holder. The SXMC (single axis motor controller) is used in “rotation only” designs. 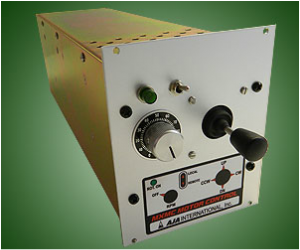 The MXMC (multi axis motor controller) is used to rotate the substrate and to control motorized Z motion. Z motion is useful for adjusting working distances in deposition systems and in transfer and/or analysis.The MXMC adds a 4 position joystick (Up / Down / Jog CW / Jog CCW) which controls both the rotation and the Z motion motors. These controllers require a 190 V 240 V single phase power input and are designed to drive 12 VDC gear motors.